Figure 2-1. 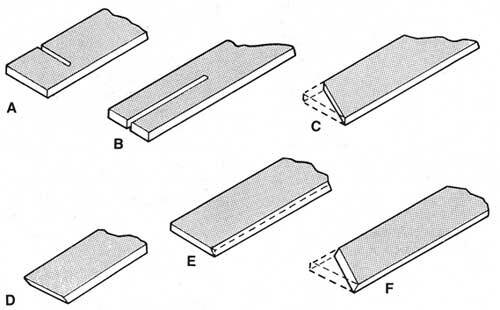 The six basic cuts: (A) crosscut, (B) rip, (C) miter, (D) cross bevel, (E)rip bevel, and (F) compound miter. 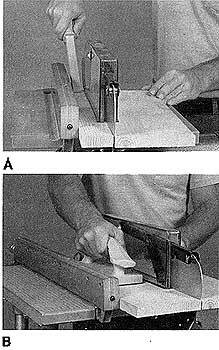 Sawing--crosscutting (cutting perpendicular to or across the wood grain), ripping (cutting parallel to or with the grain), making miter joints and other joinery cuts--is the most common, most necessary woodworking operation. You'll spend most of your operating time on the Mark V sawing. 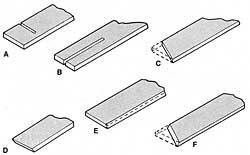 There are six basic saw cuts: crosscut, rip, miter, cross bevel, rip bevel, and compound miter (Figure 2-1). All other cuts, no matter how intricate, are combinations of these basic cuts. It is essential, therefore, to master the basic cuts in order to use the table saw to its fullest capabilities. In this tip, we concern ourselves primarily with crosscutting and ripping. 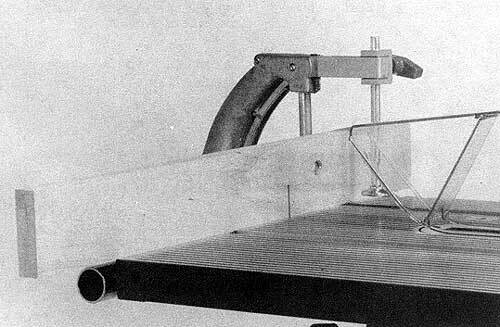 It is interesting to note that perhaps ninety percent of all operations on the table saw are ripping and crosscutting. 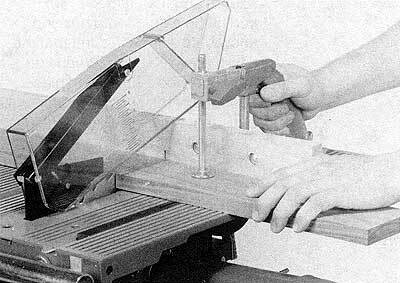 It should also be noted that the table saw should not be used in through--sawing operations without the saw guard in place. Warning: Always use saw guards and safety devices as recommended. Figure 2-2. The accessories that are used for table sawing operations are the (A) worktable, (B) extension table, (C) rip fence, (0) upper saw guard, (E) lower saw guard, (F) miter gauge, and (G) saw blade. 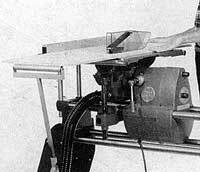 The Model 510 with the extension table system is shown. Use the accessories shown in Figure 2-2 for sawing operations. To set up your Mark V in the table saw mode, follow the instructions in the Owners Manual that came with your machine. In the sawing mode, the Mark V has 3-1/4" depth of cut at "0." 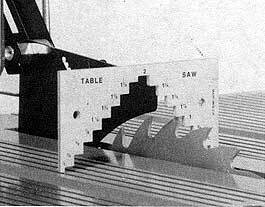 With the table tilted at 45�, the maximum depth of cut is 2-3/8". The table tilts up to 45� right, and the miter gauge can be angled a full 60� in either direction (from 90� to 30� right or left). Both the table and the miter gauge have auto-stops to help you adjust the tilt or the angle quickly to "0", 45�, or 90�. The miter gauge has a safety grip to give you better control over the workpiece. The speed is variable, enabling you to get a better cut in many different types of wood, us-ing a variety of blades. When properly aligned, the rip fence automatically squares itself with the main spindle-parallel to the saw blade. The extension table can be mounted in either the base mount or the power mount to give you extra support where you need it. 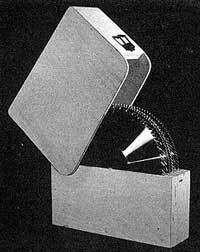 The quill feed can be used to make fine adjustments in the position of the saw blade--making it easier to be accurate. The dust chute on the lower saw guard can be connected to a dust collection system to help you collect sawdust and wood chips. Figure 2-3. An all-purpose blade can be used for crosscutting, ripping, and mitering. It is a good sizing blade, but it will not cut as smoothly as some other special blades. 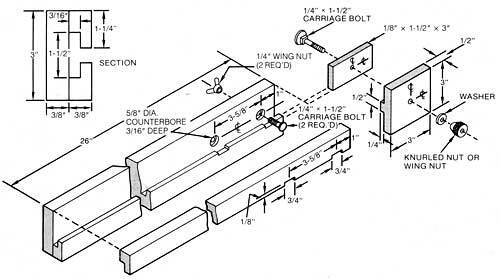 All-Purpose Blade--This blade (Figure 2-3) is the sawing work-horse of most woodworking shops. The deep gullets between the teeth provide plenty of room for waste removal on ripping operations and the sharp tooth points do a reasonably good job when crosscutting. An all-purpose blade enables you to start with basic operations like crosscutting, ripping, and mitering, but it is not the only blade you can use. You'll get better results on particular types of sawing when you use a blade that was specially designed for the work you are doing. Figure 2-4. 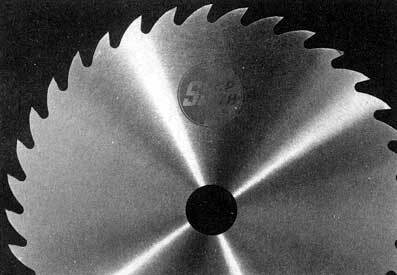 A crosscut blade has many small teeth that cleanly cut wood fibers. The blade does a fair job on miter cuts and sawing plywood. It should never be used for ripping. Crosscut Blade--A crosscut blade has many small teeth ground with alternating top bevels, sharp points and shallow gullets (Figure 2-4). The teeth cut cleanly across wood fibers, and since the waste that is produced is a fine sawdust, the blade functions efficiently with shallow gullets. However, small teeth and shallow gullets can cause the blade to choke if you try to force the cut. Here, even more than with other blade designs, feed pressure should be slow and steady--only enough so the teeth will cut as they were designed to cut. The crosscut blade does a respectable job on miter cuts, may be used on plywood, but should never be used for ripping. Figure 2-5. Each tooth of the ripping blade works like a tiny chisel to chip out its own bit of wood. Deep gullets collect and spew out the heavy waste. This blade should never be used for general-purpose sawing. Ripping Blade--A ripping blade (Figure 2-5) has large teeth ground with a square chisel tooth, large gullets and is designed for sawing with the grain of the wood. There is considerable support metal to back up the cutting edges, and generous gullets catch and disperse the sawdust. Because it has a special design, the ripping blade should never be used for general sawing. Figure 2-6. A hollow-ground blade does not have set teeth. Kerf clearance is provided by gauge reduction from the tips of the teeth to the center core that is indicated by the arrow. The blade requires more projection than other designs. Hollow-Ground Blade--A hollow-ground blade (Figure 2-6), or planer blade as it is sometimes called, produces a cut nearly as smooth as a planed edge. Most blades have set teeth; that is, alternate teeth are bent a bit in opposite directions This forms a kert that is wider than the blade thickness so the blade has clearance in the cut. The hollow-ground blade is reduced in thickness from the points of its teeth to the full-gauge center area that is indicated by the arrow in the photograph. Since this design, rather than set teeth, gives it clearance in the cut, it produces smoother cuts than other blades. The blade can function without binding or burning itself or the wood by using it with the correct projection. In a strict sense, it is a combination blade, but it is not one to leave on the machine for general sizing cuts. It does fine on plywood, but may not be tempered to stay sharp for an extended period of time under the abrasive action of the plywood glue. Additional uses for the hollow-ground blade include smooth crosscuts or miter cuts, trimming moldings, and other advanced cutting techniques. Figure 2-7. A plywood blade has many small teeth and ve,y little set. It is used for trimming and cutting plywood and laminates, and for finish crosscuts in soft woods. It produces a smooth and near splinter-free cut. 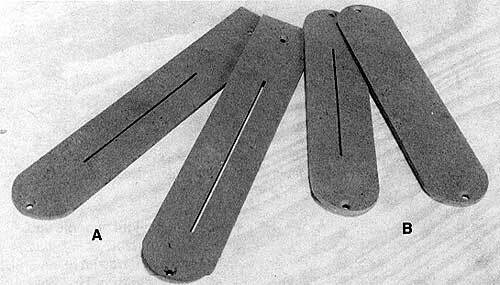 Plywood Blade--A plywood blade has many small teeth and very little set (Figure 2-7). This blade trims and cuts plywood and other laminates. Because of the very small teeth, it produces a smooth cut and also reduces splintering along the kerf. The plywood blade can also be used for crosscutting soft woods, preferably finish cuts only. General use will dull the teeth quickly, as will certain types of plywood cores (particle and fibre). 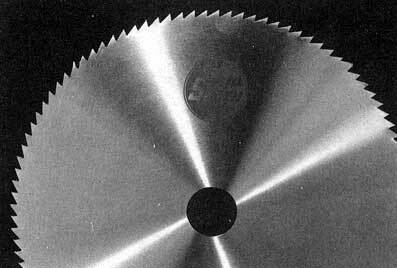 For cutting particle or fibre core plywood and other sheet stock, it would be better to use a carbide-tipped blade. Figure 2-8. 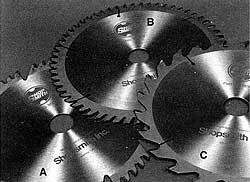 Carbide-tipped saw blades are smooth cutters used for many operations and different materials: (A) combination, (B) crosscut, and (C) rip. Carbide-Tipped Blade--Carbide-tipped blades (Figure 2-8) are more expensive than conventional blades; but, since they stay sharp for much longer periods of time, they can prove to be more economical in the long run. They are high-quality saw blades specially designed for splinter-free results in hardwoods, softwoods, and materials like hardboard and plywood, whether you are cross-cutting, ripping, or mitering. Carbide is a tough material, but it is also brittle. Be careful when handling such blades; store them so they can't contact another blade or object. Never use a car-bide blade to saw second-hand lumber that could contain nails. 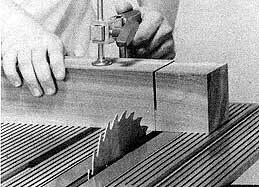 Cutting Tips--With any table saw blade, remember that the teeth above the table's surface rotate in the direction of the operator and enter the top surface of the workpiece first; therefore, place the wood with the finished side upward. This applies to plain plywood, veneers, and any form of plywood with laminates attached. When both sides of the wood are finished, use a fine-tooth blade with minimum set or a hollow-ground blade. Also keep in mind that the kerf is the slot formed by the blade. Its width will differ depending on the style, the gauge, and the amount of set on the teeth of the blade. The kerf should always be on the waste side of the cutline. Any saw blade will work more efficiently when it is clean and free of deposits that sawing wood can leave. Don't remove deposits by working with a sharp instrument like a knife. Some woodworkers use a commercial pitch remover or work on the tooth areas with a solvent and old toothbrush. An easy method to try is simply to soak the entire blade in warm water and detergent. Wipe the blade with a cloth while it is in the soapy water, rinse, then thoroughly dry it. Apply a very light film of paste wax and buff. Sharp blades are, of course, a must. They cut more efficiently and are safer to use since the operator doesn't have to utilize excessive force to feed the stock-a situation that could cause hands to slip. Some woodworkers sharpen their own blades, but it isn't recommended. A less than perfect job will do more harm than good and can even ruin the blade. The cost of sharpening is small, and the professional's experience and special equipment will ensure that the blade will be returned in like-new condition. Figure 2-9. A specialstorage case will protect your saw blades. Add a handle and you'll have a tote for cariying blades. The simplest way to store blades is to place them on hooks that are spaced so the blades won't touch each other. This, however, requires much space. To minimize space requirements, use a hook long enough to hold several blades, and use heavy cardboard or some other soft material as spacers between the blades. 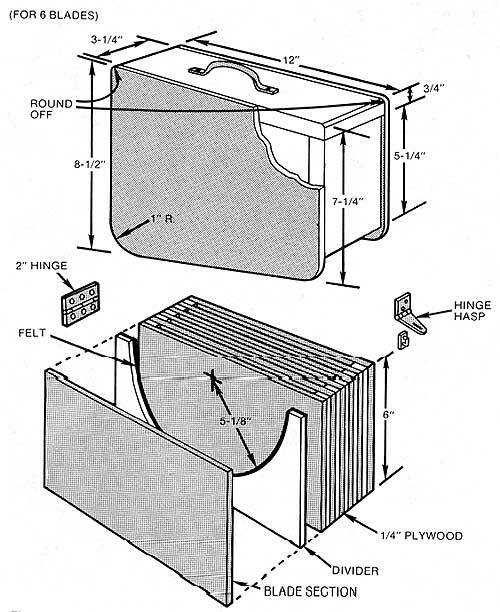 A blade storage case like the one shown in Figure 2-9 will hold six blades and, when fitted with a handle, will serve as a tote for a full assortment of blades. Layers of 1/4" plywood (Figure 2-10), some solid and some with a semi-circular cutout, are laminated to make up the storage area. Figure 2-10. 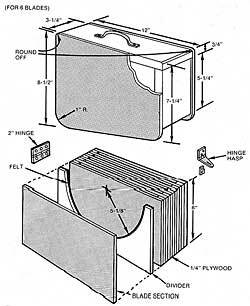 Construction details of a saw blade storage case. You can widen it for more blades by adding layers of plywood to create more slots. Click on image for larger view. You can provide for more blades by adding more plywood layers, but you must adjust the dimensions of the hinged cover if you do. To hold the blades steady and keep them from moving about, cement a piece of thick foam rubber to the underside of the cover's top piece. Figure 2-11. 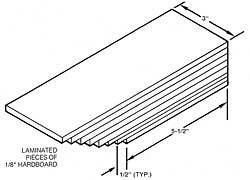 Special table inserts can be made of 1/4" hardboard: (A) Model 510 and (B) Model 500. Use a standard insert as a pattern for the shape and hole locations. There are times when you can substitute a special insert for standard equipment. The purpose of a special insert is to minimize the clearance around a cutting tool. A special insert is necessary, for example, when cutting pieces of wood so thin that the saw blade pulls them down beneath the table. Figure 2-12. Special inserts install into the table just like standard ones. Figure 2-13. 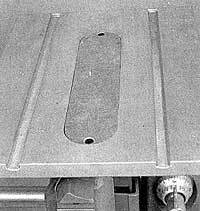 To make the slot in the insert, slowly lower the table as the machine is running. Note: The saw guard is removed for clarity. Special inserts, like those shown in Figure 2-11, are easily made from 1/4" hardboard by using a standard insert as a pattern for shape and hole location. Once the special insert is made, raise the table to its highest position and install the insert (Figure 2-12). 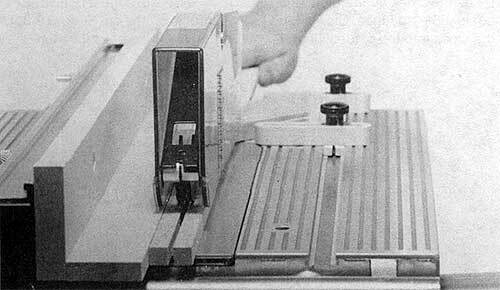 To cut the slot in the insert, turn on the machine, set the speed dial to the proper speed, and very slowly lower the table over the blade (Figure 2-13). Each time you use the insert you must align the slot exactly with the blade. Danger Zone--The danger zone on the Mark V in the sawing mode extends 3" on all sides of the blade, 2' in back of the blade, and 8' in front of the blade. The reason for the extended danger zone in front of the blade is that a saw blade can kick a board back. The blade may also kick a board forward, but not as hard as backward. Always keep your hands, fingers, and other parts of your body out of the danger zone. Use push sticks, push blocks and other safety devices to help guide and control workpieces. 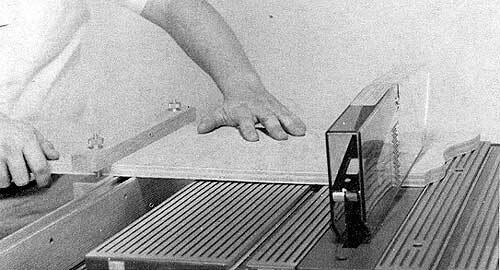 Never operate the table saw without the upper and lower saw guards in place. The one exception to this rule is when you saw part way through a board--cutting a dado, groove or rabbet--then you must remove the upper saw guard. Whenever you remove the upper saw guard, keep the lower saw guard in place and work with extreme caution. Use safety devices to move the stock past the blade. Never stand directly in front of or in back of the blade; always stand to one side or the other. Make all adjustments with the blade stopped, with the one exception of changing the speed. Never try to change the configuration of the table or the power plant before the machine has stopped. Let the blade get up to full speed before cutting. Always cut against the rotation of the blade. This keeps the blade from grabbing the wood out of your hands. Use the miter gauge or rip fence to guide your work. Free-hand cuts are extremely dangerous, inaccurate and not recommended. Make a five-point check: all five locks--power plant, carriage, table height, table tilt and quill--should be secure. Never reach under the table to tighten the locks, remove scrap or make adjustments while the saw is running. Never reach over the blade while It's running, even with the upper guard in place. Do not rip large sheets of plywood or similar materials by yourself. Get at least one helper. Always use the proper table insert for the operation. Turn off the power and let the machine come to a full stop before you remove workpieces or clear scraps away from the blade. 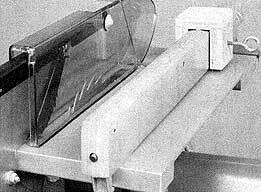 Saw Guards--The Mark V is equipped with saw guards to provide a physical barrier between you and the moving blade, no matter what height or angle you adjust the worktable. These saw guards have several other safety features. The lower saw guard has a dust chute that allows you to attach a dust collection system so you can collect the waste while you're sawing. The upper saw guard is clear so you can see the cutline. There's a removable plastic insert in front of the blade to catch wood pitch. This can be easily cleaned to keep your line of sight clear. 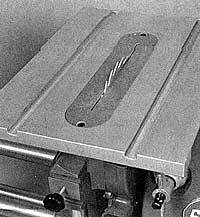 The upper saw guard on the Model 500 is mounted on a splitter that keeps the saw kerf from closing and binding the blade. On this splitter there are two anti-kickback pawls that help keep the blade from kicking the stock back toward you. The upper saw guard on the Model 510 has a riving knife that is positioned 1/8" from the blade regardless of stock thickness. The riving knife has anti-kickback cams that help capture the stock in the event of a kickback. Failing to use the upper saw guard and safety devices. Crosscutting against the rip fence without using a spacer. Using a dull or dirty blade or a blade with insufficient set. Cutting freehand or ripping badly warped wood. Dropping pieces of stock on an unguarded saw blade. Letting go of material before it is past the saw blade. Ripping stock with loose or large, unsound knots. Cutting wet or improperly seasoned wood. Figure 2-14. Before beginning a table saw operation, adjust the table height so the blade protrudes 1/4" to 3/8" above the stock, as shown. Click on image for larger view. Blade projection (Figure 2-14) refers to the amount of blade that is visible above the workpiece. 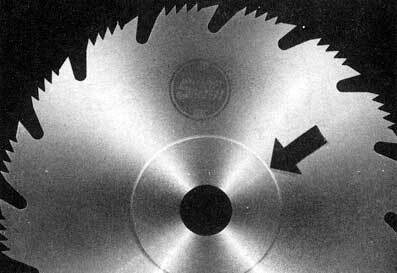 Except in the case of hollow-ground blades, which are set slightly higher, keep the projection within 1/4"and 3/8". The upper guard has a depth-of-cut scale so it is easy to adjust the projection of the blade. Just lower the guard over the blade and then adjust the table height. For example, if you are sawing 3/4" stock and want a 1/4" projection, adjust the table height until the tip of the blade aligns with the 1" mark on the guard. Figure 2-15. Use a step gauge to set blade projection. 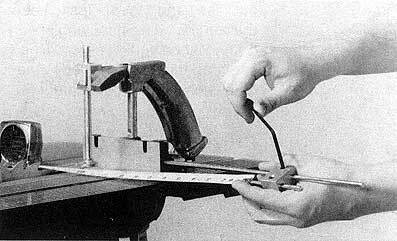 Another way to set blade projection is to use a step gauge like the one shown in Figure 2-15. 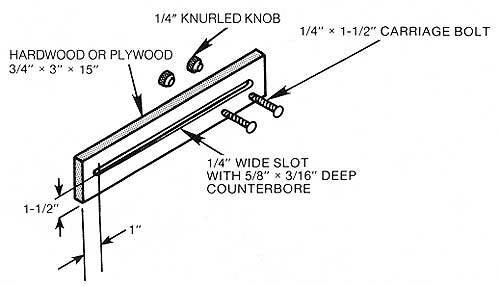 A gauge you can make by laminating 1/8" pieces of hardboard is shown in Figure 2-16. Both the scale on the saw guard and a height gauge can be used to set the projection of saw blades and other cutters like the dado accessory. Figure 2-16. 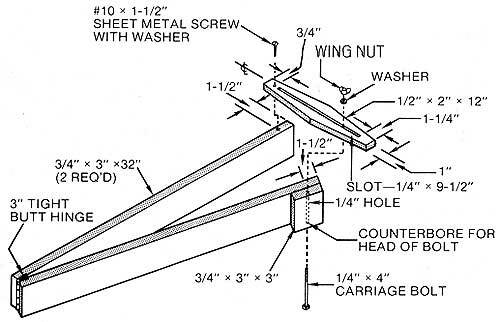 Construction details of a homemade height gauge. 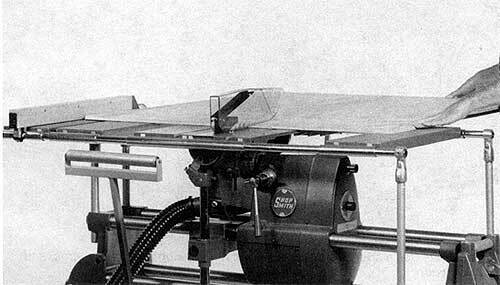 Before you begin any table saw operation, set the Mark V to run at the correct speed. To do this: turn the machine on, turn the speed dial to the correct speed and let the saw come up to speed. Caution: Never turn the speed dial when the Mark V is stopped. You could damage the speed changing mechanism. Always turn the speed to Slow before turning off the machine. The correct speed is determined by the operation you're about to perform and the type of material you're sawing. Generally, you can use faster speeds in softer woods. Faster speeds will also give you a smoother cut. Slower speeds give the machine more torque to get through hard, dense woods. To determine the right speed for the job, refer to Table 2-1. A good rule of thumb is: The deeper the cut or the harder the wood, the slower the speed. But if the blade turns too slowly, you may get a rough, splintery cut. Crosscutting, cutting a board perpendicular to or across the grain, is one of the most common wood-working operations. It's also known as a cutoff operation, or cutting a board to length. 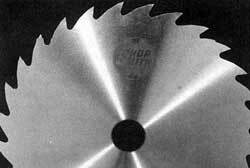 To make a crosscut, first mount the proper saw blade. Make sure both the upper and lower saw guards are in place and that the splitter on Model 500 or the riving knife on the Model 510 is directly in line with the saw blade. Adjust the table height so that the saw blade will protrude about 1/4" above the stock. When the table height is properly adjusted, make a five-point check. All five locks--power plant, carriage, table height, table tilt, and quill--should be secure. Check that the miter gauge is square to the blade, and adjust the safety grip to the thickness of the stock. Warning: Always use the miter gauge to guide the stock as you saw it. Decide on which side--right or left--of the blade is the most comfortable for you to stand when you saw. Warning: Do not stand directly in line with the blade. Place the miter gauge in the slot on the same side of the blade that you're standing. Figure 2-17. Mark the stock where you want to cut it, using a square and a sharp pencil. An "X" will help you remember which is the waste side of the stock. 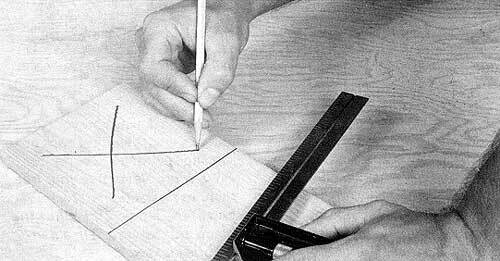 Mark the stock where you want to cut it, using a square and a sharp pencil (Figure 2-17). Remember that the saw usually makes a 1/8" kerf as it cuts. If you cut straight down in the middle of your line, your stock will be 1/16" short. Instead, cut on the outside of the line. Squeeze the safety grip to clamp the stock in the miter gauge. Push the stock forward until it touches the saw teeth so that you can see if the cutline is properly aligned with the blade. Figure 2-18. Use your free hand to help support the board and keep it flat against the miter gauge. Pull the stock away from the blade. Turn on the Mark V, turn the speed dial to the proper speed, and let the machine come up to speed. Then carefully guide the stock past the blade. Use your free hand to help support the stock and keep it flat against the face of the miter gauge (Figure 2-18). 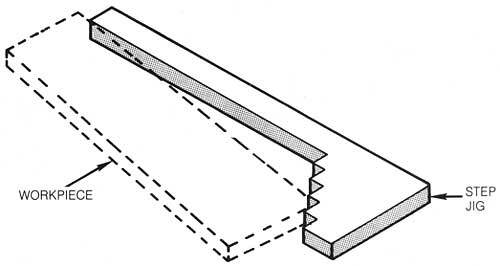 When crosscutting narrow stock or cutting off a thin piece, use a special insert (Figure 2-11) or move the blade close to the table saw insert on the side of the blade where the stock is being cut. This will help keep small pieces of stock from falling through the insert. Don't feed the stock any faster than the blade will cut. If the machine bogs down, slow your feed rate and let the saw get back up to running speed. Warning: Never use your free hand to push against the free end of the stock. This binds the blade and can result in a dangerous kickback. Use your free hand for additional support only. After the cut is complete, turn the speed dial to Slow and turn off the machine. Warning: Never pick up a cutoff while the blade is still running. Your hand holding the miter gauge could slip Into the blade; your free hand might nudge the cutoff into the blade, causing a kickback; or the action of the blade on the cutoff might pull your free hand into the blade. It takes only a few seconds for the blade to stop after the switch has been turned off. Chances are that when you start cutting boards to length, you'll start out with boards 8' long or longer. Crosscutting a long board can be awkward on a table saw, but here are a few simple techniques to help make this task easier. If possible, don't start by cutting. little pieces off the end of the long board. This is hard to do accurately. Instead, start cutting long boards in the middle. This gets them down to a manageable length quickly. Figure 2-19. 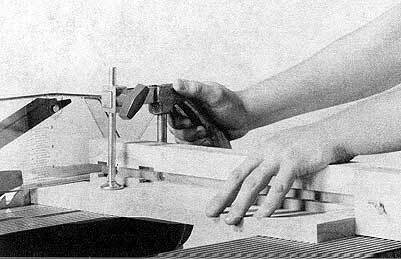 When crosscutting long stock on the Model 510, use the extension table system. Use an extension table mounted in either the power mount or the base mount-whichever end of the board needs the most support. 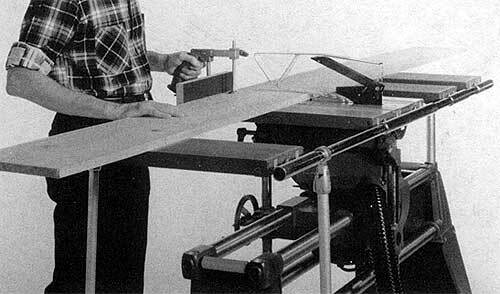 If you crosscut a lot of long boards, you will want to invest in a second extension table so that you can support the stock at both ends. The Model 510 has the extension table system that provides additional support for cross-cutting operations (Figure 2-19). A miter gauge extension will also provide extra work support because it increases the surface area of the miter gauge. Actually, it's good practice to use an extension on all crosscut work, especially if the workpiece is long. Figure 2-20. The standard miter gauge extension provides extra support when crosscutting. The extension that is available for the Mark V, shown mounted in Figure 2-20, comes with attachment hardware and is easily mounted because of the pair of slots that are part of the miter gauge design. The position of the extension can be reversed so it can be placed in the miter gauge for use on either side of the saw blade. It's a good idea to have several extensions on hand, each one for a specific purpose. Should you wish to make your own, the standard extension can be used as a pattern or use the dimensions and hole locations in Figure 2-21. Figure 2-21. Dimensions and hole locations for a homemade miter gauge extension. Figure 2-22. 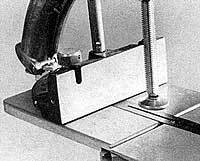 Construction details of an adjustable miter gauge extension. Figure 2-22 shows an adjustable miter gauge extension that is ideal for crosscutting and mitering. 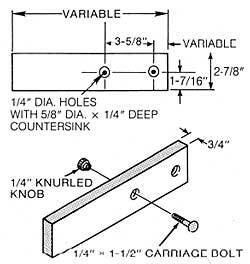 Use a router to form the 1/4" slot that positions the extension on the miter gauge. 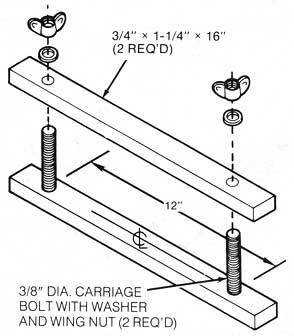 In the same way, form a 5/8" wide counterbored slot centered on the 1/4" slot to accept the two carriage bolt heads. Glue fine sandpaper to the face, as mentioned later, for more holding power. Figure 2-23. 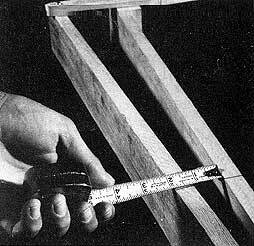 Use a long miter gauge extension when crosscutting long stock. Miter gauge extensions do not have to be a specific length. When crosscutting extra-long pieces, the extension can span across the table and beyond it (Figure 2-23). When necessary, the extension can rest on the extension table. When you use a long extension, the saw blade will cut through it. This will not harm the extension, and the kerf that is formed can be used as a guide. 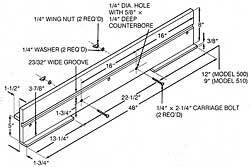 The cut line can be marked on the stock with a square and then aligned with the kerf in the extension. Thus you know beforehand the line that the saw blade will follow. When you mark the stock, be sure to place the head of the square against the edge that will bear against the extension. 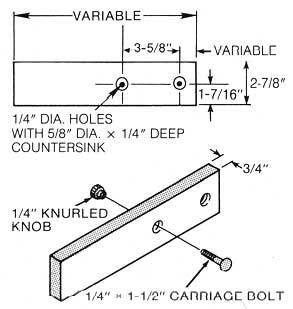 Check the miter gauge adjustment if the kerf doesn't follow the line. You can use the miter gauge safety grip with an extension. 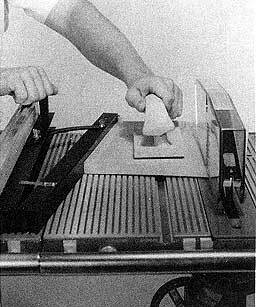 Many woodworkers face extensions with fine sandpaper to provide a high-friction surface that is an aid on all operations, but especially useful when the miter gauge is adjusted for an angular cut. 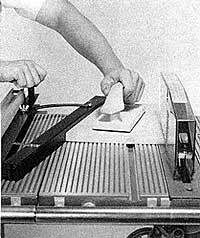 The sandpaper helps to keep the workpiece from moving or drifting when cutting miters. The sandpaper may be applied to the extension with rubber cement. Figure 2-24. 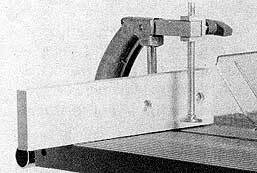 The kerf in a miter gauge extension can be used as a guide when crosscutting to length. Except for squaring off the end of a board, crosscutting is usually done to cut a piece, or several pieces, to an exact length. When you need only one piece, the simplest method is to cut to a line that you have marked with a square. You can visually align the mark on the workpiece with the saw blade or YOU can use a miter gauge extension that has a kerf through it (Figure 2-24). Other methods should be used when you need more than one piece of the same length. One method is to work with the miter gauge stop rod (Figure 2-25). By adjusting the two rods, any number of pieces can be cut to any length up to 18". The stop rod can be used at either side of the miter gauge, which allows it to be used whether the miter gauge is on the left or right side of the blade. For short pieces, up to 8" long, secure the short rod in the miter gauge and use the long rod as an adjustable stop. For longer workpieces, up to 18", secure the long rod in the miter gauge and use the short rod as an adjustable stop. Figure 2-25. The miter gauge stop rod can be used to gauge the length of long or short workpieces dependir on which rod is secured in the miter gauge. Figure 2-26. To adjust the miter gauge stop rod for length of cut, measure between the rod and blade. If the blade has set teeth, measure from the tip of a tooth that points toward the rod. Adjust the stop rod for the length you require (Figure 2-26) by measuring between the end of the rod and the blade. If the blade has set teeth, be sure to measure from the tip of a tooth that points toward the rod. Once the setting is made, any number of pieces can be sawn to the same length by butting the end of the workpiece against the stop rod and making the pass. Warning: Do not position the miter gauge stop rod so that it crosses in front of the blade. Figure 2-27. The miter gauge extension has a sliding stop so it can be used to gauge the length of one or more workpieces. Notice how the extension table provides extra support. 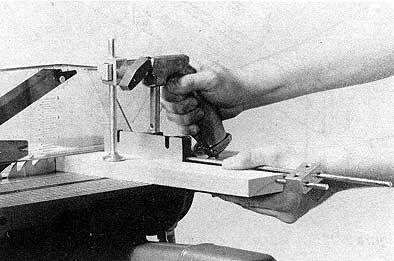 A miter gauge extension that you make yourself can be used for cutting duplicate pieces (Figure 2-27). The extension, which can be used whether the miter gauge is on the left or right side of the saw blade, will allow cutting of duplicate pieces as long as 24". To use it, measure between the sliding stop and the saw blade and then do the sawing. Figure 2-28. Construction details of a miter gauge extension with sliding stop. Click on image for larger view. Construction details of the extension are shown in Figure 2-28. When you make the stop, allow just a fraction of clearance so it can slide smoothly in the extension's T-shaped slot. Accessories you make, like this one, should be carefully made, smoothly sanded, and given one or two applications of a penetrating sealer. When you treat them right, they become tools that will function for as long as you do woodworking. Figure 2-29. The workpiece is placed well ahead of the blade and butted against a spacer that is (A) clamped or (B) screwed to the rip fence. When the pass is complete, there will be ample room between the fence and the blade so the cutoff can't be trapped and kicked back. 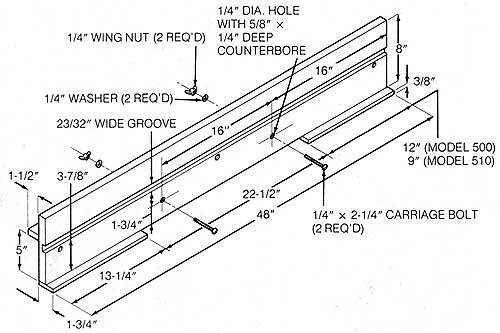 Spacers for the Rip Fence--The rip fence can assist in cutting-to-length operations if a spacer is clamped or screwed to the rip fence (Figure 2-29). The spacer must be at least 1-1/2" thick. Figure 2-30 shows how a screw-type spacer is made. Warning: The rip fence alone must never be used as a stop to gauge the length of a cutoff. The cutoff, when the pass is complete, will bind between the fence and the blade and be kicked back. Figure 2-30. Construction details of a screw-type spacer. Figure 2-31. Another stop design. Its advantage is that it can be locked at any point along the rip fence. This makes it usable for more than cutoff work. The distance between the fence and the blade minus the thickness of the spacer determines the length of the cutoff. The workpiece is butted against the spacer and then advanced for cutting. When the pass is completed, there is ample room between the rip fence and the blade so the workpiece can't be trapped. Another spacer design is shown in Figure 2-31. 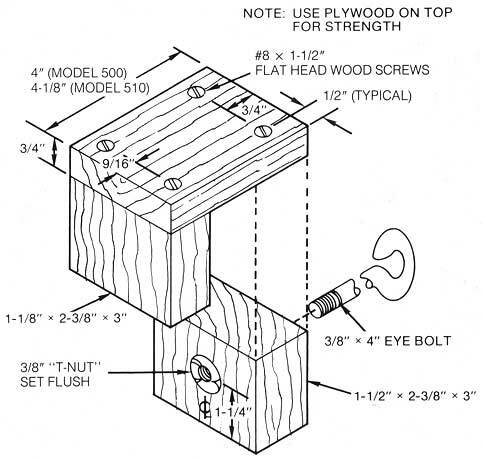 An advantage of this one, made as shown in Figure 2-32, is that it can be placed anywhere on the rip fence, which makes it usable for other wood-working operations. Warning: The workpiece MUST clear the spacer well before the end of the cut to avoid binding the work-piece between the spacer and the blade. Figure 2-32. Construction details of a movable spacer. Figure 2-33. 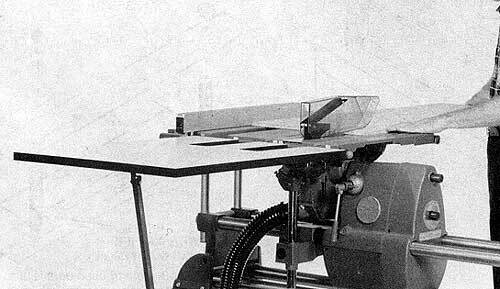 The front table extension, an accessory for Model 500, can line up with either table slot and increases table depth in front of the blade by 7". 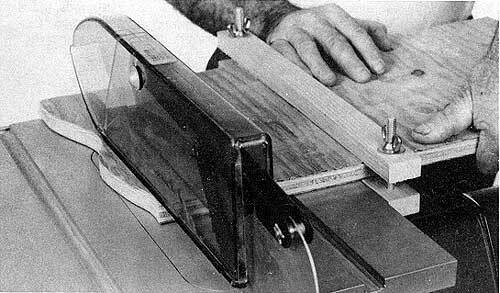 Crosscutting wide boards requires maximum support in front of the blade. On the Model 500, actual table length in front of the blade with projection set to cut 3/4" stock is about 7", which is good support for average work. On the Model 510 there is 10" of table in front of the blade. 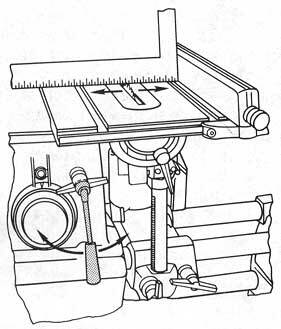 A front table extension (Figure 2-33) is available as an accessory for the Model 500. This increases the usable table depth in front of the saw blade by 7". A single locking knob makes it easy to attach or remove; its miter gauge slot is compatible with the slots in the worktable. Figure 2-34. 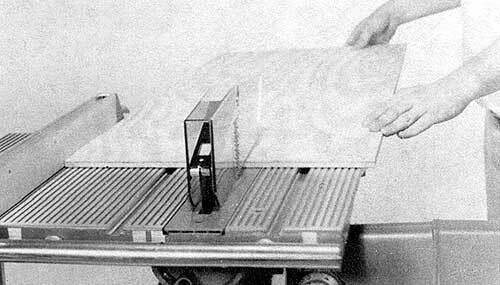 You can cut extra-thick material by working this way. Make one cut a bit more than halfway through the stock. Mark the cutline, invert the stock, and make a second pass. Warning: Work with extreme caution because the upper saw guard Is removed for both passes. When you are cutting unusually thick material and the machine's maximum depth of cut won't allow you to cut through in a single pass, you can do the job by making two passes. Warning: When cutting part way through stock, it is necessary to remove the upper saw guard. Whenever the upper guard is removed, keep the lower guard in place and work with extreme caution. Set the blade's projection to a little more than half the stock's thickness and make one pass. Use a square so you can pencil mark the line of the kerf down one side of the stock. Invert the stock and place it so the pencil mark is in line with the saw blade and make a second pass (Figure 2-34). Figure 2-35. To set up for ripping, use the quill feed to make fine adjustments in the distance from the saw blade to the rip fence. 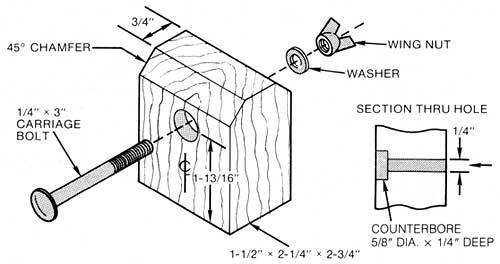 Measure from the fence to the tip of a saw tooth that's set toward the fence. Click on image for larger view. Ripping is cutting parallel to or with the grain of the wood. It's also known as cutting to width. 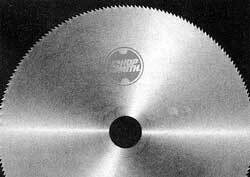 Mount the proper saw blade. Before turning on the machine check that the saw guards are in place, adjust the table height, and make a five-point check. All five locks--power plant, carriage, table height, table tilt, and quill--should be secure. When ripping, use the rip fence to help guide the wood. Mount the rip fence to the table, slide the rip fence so that it's the desired distance away from the saw blade, then lock it in place. Use the quill feed to make fine adjustments (Figure 2-35). Be sure to measure from the fence to the tip of a tooth that's set toward the fence. When properly aligned, the rip fence automatically sets itself parallel to the saw blade. However, on critical setups, it's wise to check this. Measure the distance from the rip fence to the saw blade at both the front and back of the machine. Mount a feather board in front of the blade to help hold the stock against the fence. Figure 2-36. The rip fence gauges the cut width and acts as a control throughout the pass. Hands are placed so they can't come close to the cut area. Stand in front of the Mark V, on the opposite side of the blade than the rip fence. (This position will help you keep the stock pressed against the fence as you rip it.) Turn on the Mark V, turn the speed dial to the proper speed, and let the saw come up to speed. Place the stock on the table and against the rip fence. Slowly feed the stock into the blade while keeping it pressed firmly against the rip fence (Figure 2-36). Don't force the cut or go any faster than the blade can cut. Warning: As you finish the cut, use a push stick or push block to help feed the last portion of the stock past the blade (Figure 2-37). This will keep your hands and fingers out of danger. When the cut is complete, turn off the machine and let it come to a complete stop before removingthe stock or any scraps. Figure 2-37. As you finish the rip cut, use a (A) push stick or (B) push block to help feed the last portion of the stock. Click on image to see larger view. Figure 2-38. When ripping narrow stock, use a fence straddler to help finish the cut. When ripping narrow stock--1-1/2" to 3" wide--use the fence straddler to finish the cut (Figure 2-38). When ripping stock less than higher than the thickness of the stock (Figure 2-39) and screw it to the rip fence so that the fence doesn't interfere with the saw guard or the stock being cut. Use a similar size piece of scrap stock to push the good stock past the blade (Figure 2-40). Caution: Do not use the plastic push stick from the safety kit. When the good stock is clear of the blade, turn off the Mark V. Hold the scrap push stick steady until the blade comes to a complete stop, then move it away from the blade. To keep small pieces of stock from falling through the table insert, move the blade close to the insert on the side of the blade where the stock is being cut, or use a special table insert. The construction details for the special table inserts are shown in Figure 2-11. Figure 2-39. 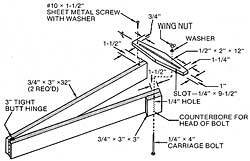 Construction details of a spacing fixture that is used when ripping stock less than 1-1/2" wide. Click on image for larger view. Figure 2-40. Clamp a spacing fixture to the rip fence to keep the fence from interfering with the saw guard or the stock being cut. Figure 2-41. To rip wide stock, mount the rip fence so it straddles the extension table and the worktable. The rip fence accurately guides the stock. If you're ripping stock that is 5-1/2" to 8-1/2" wide (Model 500) and 8-3/4" to 10-3/4" wide (Model 510), you can mount the rip fence so it straddles the extension table and the worktable. Be sure that the extension table and the worktable and rip fence are properly aligned, then slide the power plant and carriage to the right so that the worktable butts against the extension table. Position the rip fence so the saw blade is the desired distance from the rip fence and make fine adjustments with the quill feed. As you feed the stock, the rip fence will accurately guide the stock (Figure 2-41). Figure 2-42. A support table ne/ps support large stock at the outfeed end of the worktable. Whenever you need to rip large pieces of stock such as plywood, paneling and other sheet materials it is very important that the stock be properly supported throughout the cut. Also, get a helper if the material you're ripping is too large to safely handle by yourself. There are several setups that provide the proper support. One setup for ripping sheet materials is to mount an extension table on one or both sides of the machine, then mount the rip fence on the extension table. Figure 2-43. The Model 510 extension table system supports wide stock. 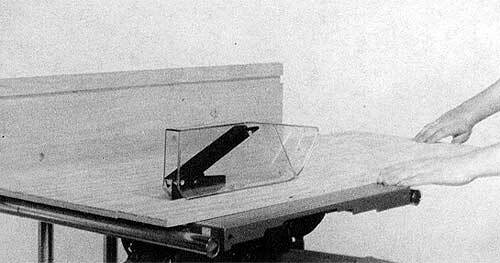 You can also mount a support table (Figure 2-42) or use a roller stand at the outfeed end of the worktable. For even more support, also use a support table (Model 510 only) or roller stand at the infeed end of the worktable. 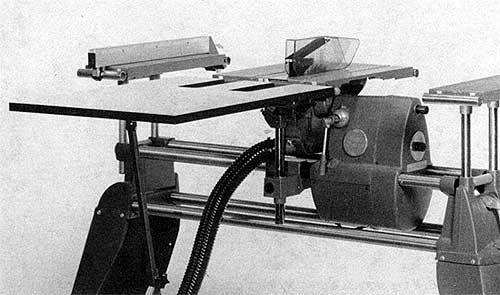 With the Model 510, you can also use the extension table system (Figure 2-43). When ripping long stock it is extremely important to support the stock during the cut. Warning: If the stock is too long to safely handle by yourself get a helper to assist you. Figure 2-44. Use a support table when ripping long stock. 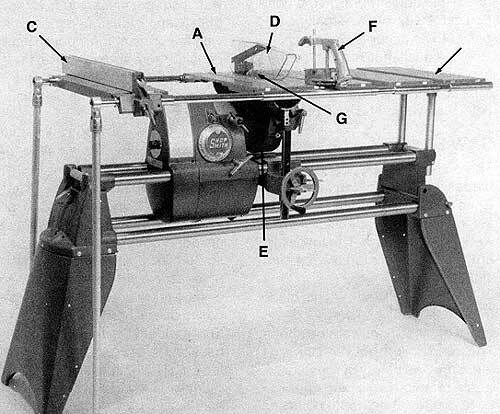 One way to support the stock is to mount a support table to the outfeed end of the worktable (Figure 2-44) or position a roller stand 1' to 4' away from the outfeed end of the worktable (Figure 2-45). 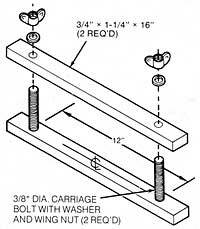 You may also want to position a roller stand at the infeed end of the worktable. If the stock is extremely long (over 6'), you will want to use a roller stand positioned 2' to 4' beyond the support table (Figure 2-46). On the Model 510 you can mount a second support table at the infeed end of the worktable for extra support. Figure 2-45. A roller stand provides support for long stock. Figure 2-46. If the stock is extremely long, use a support table and two roller stands. As you feed the stock, it comes off the outfeed end of the table and the support table and/or the roller stand will support it. Figure 2-47. Use a rip fence extension when ripping long and wide boards, and even plywood. Figure 2-47 shows a rip fence extension that is used for ripping long and wide boards, and even plywood. 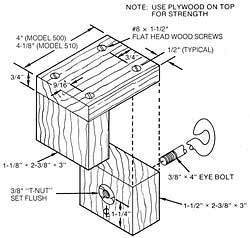 To make the rip fence extension (Figure 2-48), use 3/4" plywood or clear straight hardwood. Drill and counterbore holes for the mounting bolts. Attach the support to the back with glue and screws. Mount 1-3/4" wide strips to the bottom edge for more support. Figure 2-48. Construction details of a rip fence extension. Click on image for larger view. Figure 2-49. Construction details of a guide used for ripping stock with irregular edges. Click on image for larger view. Sometimes a piece of stock may not have an edge that is straight enough to be used against the rip fence. Maybe the piece has been cut on both edges with a jigsaw or bandsaw, or it might be uneven, rough lumber. These pieces of stock can be rip cut by the guide-strip method. 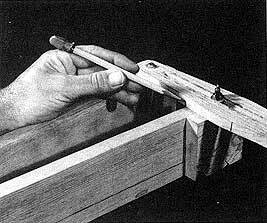 A narrow, straight piece of stock is clamped or tack-nailed to the underside of the stock to be used as a guide. Or make a guide as shown in Figure 2-49. Figure 2-50. You can straighten stock with irregular edges by working this way. The guide rides against (A) the rip fence on the Model 510 and(B) against the edge of the table on the Model 500. On the Model 510, mount the rip fence to the extension table and lower it until the top of the rip fence is flush with the top of the table. The guide will ride against the rip fence (Figure 2-50A). 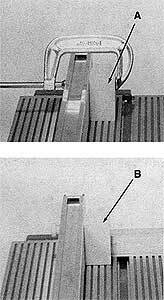 On the Model 500, the guide rides against the edge of the table (Figure 2-50B). Where you place the guide strip will determine how much of the irregular edge of the stock will be removed. Since the worktable can be moved along the way tubes, some large-sized pieces of stock can be handled in this fashion. Figure 2-51. Construction details of a taper guide. Click on image for larger view. Taper rip cuts, needed for many projects, call for a taper guide that has one straight side that can move along the rip fence and an adjustable side that can be locked at an angle to gauge the amount of taper. You can buy a taper guide or make one as shown in Figure 2-51. Surface-mount or mortise the hinge on the ends of the legs. The crosspiece, or brace, that is used to secure settings can be made of metal instead of wood. Figure 2-52. Mark across the legs 12" away from the hinged end; then you can measure between the marks to set the guide for a particular taper per foot. After the guide is assembled, mark a line across both legs 12" away from the hinged end. Because of the 12" marks, you can preset the guide for particular tapers by measuring between the legs (Figure 2-52). For example, if you were making a stool with legs that are 12" long, 3" wide at the top, and 2" wide at the bottom, you would need to cut a 1" per foot taper. By separating the legs 1" at the 12" mark, you would have the correct setting for the guide to cut the taper on two adjacent sides only. Figure 2-53. You can calibrate the cross brace for particular taper-per-foot settings. To provide a scale for future adjustments, separate the legs to various dimensions across the 12" marks and use a pencil to mark the settings on the cross brace (Figure 2-53). 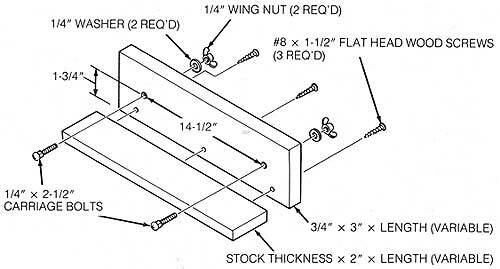 When a project component, a table leg, for example, needs to be tapered on four sides, make one pass and then a second pass on an adjacent side of the stock without changing the guide's setting. Adjust the guide to twice the original setting and then make a third and fourth pass consecutively on the next adjacent sides. Figure 2-54. This is how the workpiece is placed in the taper guide. Place hands as you would for regular rip cuts. Be sure the guide rides against the fence throughout the pass. Use a taper guide as shown in Figure 2-54. 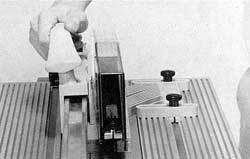 The workpiece is placed flush against the leg of the guide. Both the guide and the workpiece are then moved forward to make the cut. 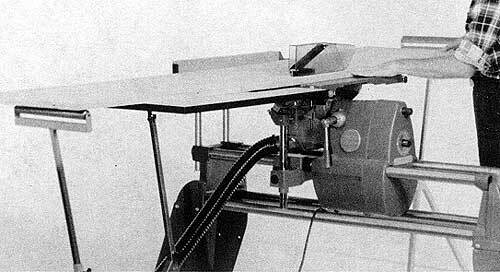 Notice that the worktable is positioned at the right end and lined up with the extension table to increase the work-piece support area. The operation is done just like a routine rip cut. The only difference is that the workpiece is fed forward by moving the guide. Figure 2-55. When you require the same taper on opposite edges, reposition the workpiece, set the guide for twice the originaltaper, and make a second pass. When the same taper is required on the opposite side of the stock, make the first cut as just described; then adjust the guide to twice its original opening. Position the stock so the edge already tapered is against the guide, and make a second pass (Figure 2-55). Other Tapering Techniques--The step guide, diagrammed in Figure 2-56, is a good aid for production-type work because it eliminates having to set the variable guide for different tapers. The steps in the guide, which are dimensioned for particular cuts, gauge the amount of taper. Each step will consistently produce the same taper. The work is placed so that one corner is in the correct step and the opposite end butts against the arm of the guide. The straight edge of the guide rides against the rip fence. against the rip fence. Figure 2-56. A step guide is a good aid if you do production work and will frequently be needing a particular taper. Click on image for larger view.